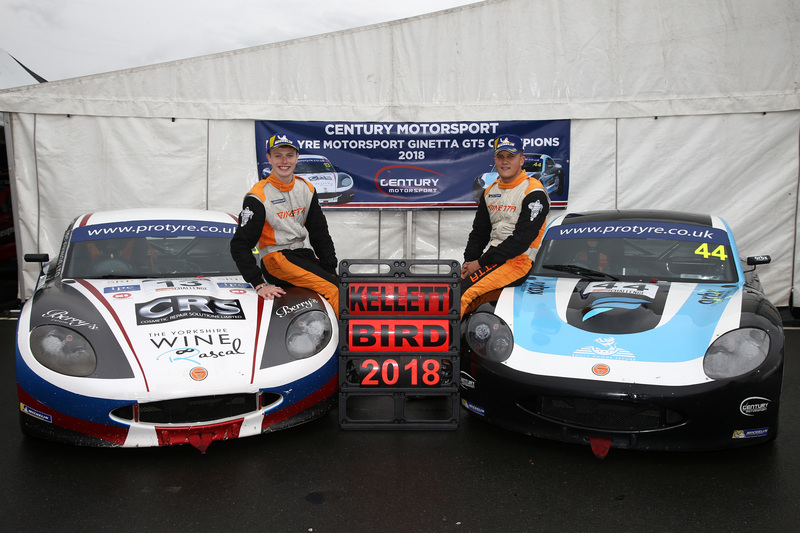 Century Motorsport headed to the final round of the Ginetta GT5 Challenge championship last weekend, feeling fairly confident as Jmes Kellett was leading the driver standings, with Max Bird in fourth place in the championship and as a team they were also topping the team standings. There had been news that competitor Shane Stoney who was just 26 points behind Kellett, would not be racing in the final round, making the task of becoming the 2018 champion slightly easier for Kellett. Early Saturday morning, the final qualifying session of the season got underway. Kellett and Bird both impressed and posted the top two times respectively. Bird was just 0.054s away from pole. Later that afternoon, race 1 started with a front row lockout for both Century drivers for the second time this season. The weather was miserable but the team were excited, as Kellett could be crowned 2018 champion after this race, with two races still remaining. Bird had an unfortunate start to the race, dropping down to sixth position on the first lap. He soon made this up and stormed his way back to the front row where he then grabbed the lead off Kellett on the penultimate lap. Kellett dropped another place on the final lap, finishing the race in a very relaxed third position, knowing that he had done enough to take the championship title, with still two races remaining. A superb drive from Bird saw him claim race victory, along with achieving the fastest lap of the race. Sunday lunchtime, the sun was shining and race 2 was about to get underway. Bird started the race from pole position with Kellett just behind him on the second row. Kellett found second place off the line and Bird controlled the entire race with Kellett just behind him, right up until the finish line. Again, Bird achieved the fastest lap of the race and claimed his second victory in a row! There was a 10-place reverse grid for race 3; meaning Bird would be starting the race from tenth on the grid. He had hunted out the lead from sixth position in race 1, so there was still a good chance that he could end with another podium finish in the final GT5 Challenge race of the season. Bird had an excellent start, finding three positions off the line. He stormed ahead to find fourth place by lap 4 and then on the final lap he grabbed the podium spot of third and held on to it, making it a triple podium for Bird for the first time this season! Kellett gained four places off the line after starting from ninth on the grid and then from lap 2 onwards, he found one more position per lap, eventually snatching the lead from the #29 car that had led the race after starting on pole. Kellett also achieved the fastest lap of the race, with Bird achieving the second fastest, just one-hundredth of a second slower than Kellett’s time. 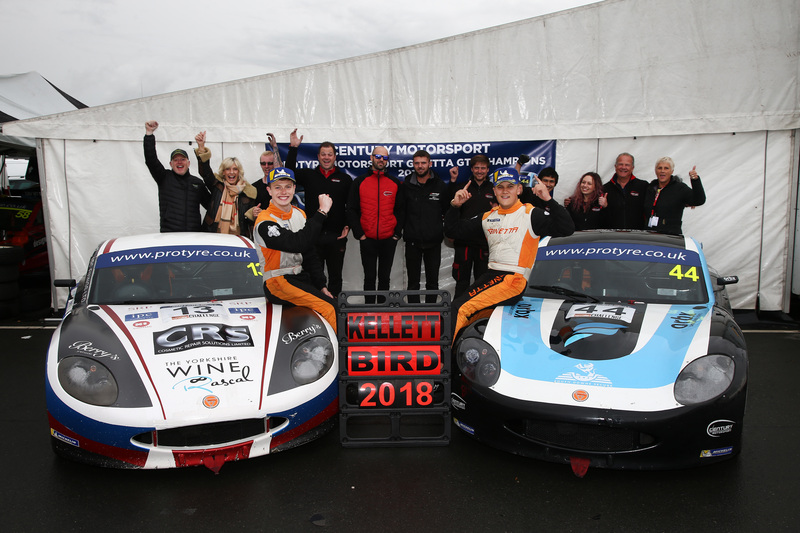 This was an excellent end to the season, with Bird achieving incredible results all weekend; Century claiming the teams’ championship title; and Kellett winning the championship overall, along with winning the final race of the season after starting from ninth on the grid! “What an incredible weekend at Donington! After my pace at Knockhill, I knew I’d be quick enough to secure the championship in my first race at Donington – I just had to finish! Quali went perfect being on pole by only just half a tenth from Max so the Century boys in P1 and P2 was mega. First race I knew I had to finish and being on pole with good pace I just had to bring the car home. A good race in very exciting conditions meant I finished a very relaxed third and secured the win in the championship!What an incredible feeling! All the pressure was off! All the hard work and ups and downs throughout the championship have fully paid off! 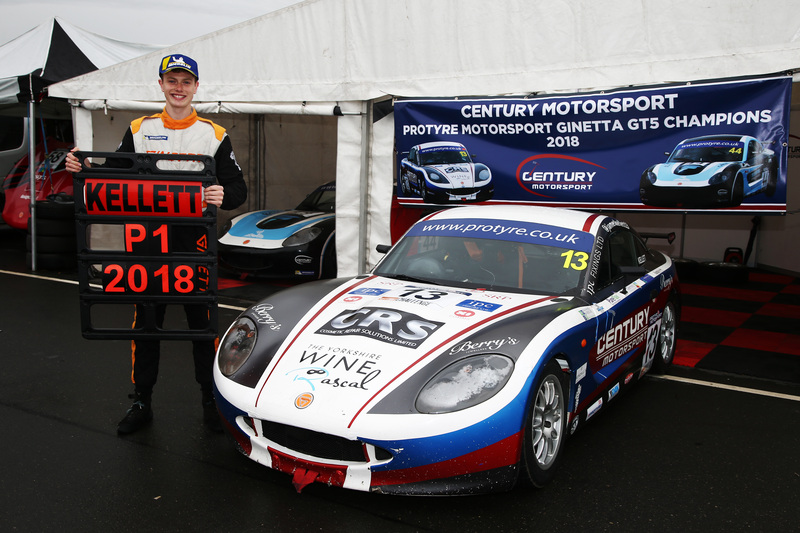 2018 Protyre Motorsport Ginetta GT5 Champion! The Championship was mine but I really wanted to finish off the championship on a high, with a win! The last race was a reverse grid so I was starting 9th on the grid meaning I had a lot of work to do in the short time of racing to get to the front. A good start gaining a couple places on the first lap but still having to work hard with everyone else trying to get the best place they could in the last race. What an incredible race going forwards in the pack then backwards and finally on the second to last corner making the move for the win and making it stick! Coming across the line as the champion and winning the race from 9th was the best feeling in the world and I think the team felt exactly the same. “We knew coming into this weekend that we would have to get it seriously wrong for James not to win the title, but as the old saying goes it’s not over until the chequered flag drops! We bounced back well after a difficult test with a front row lock out. Both drivers only separated by 5 hundredths, yet ¾ of a second ahead of the rest of the field shows how hard both these drivers have been working, and how well the team have the cars dialled in. Race one was so entertaining to watch, James scampering off in the lead whilst Max had a bad getaway off the line saw him drop a low as 7th. As James looked to be pulling away, Max slowly ate his way through the field and ended up taking the lead and the eventual win! James taking the championship in race 1 took great pressure off him and they both provided 2 more excellent and entertaining races. Max winning the second race under great pressure, and then James winning the reverse grid, whilst both drivers just cut through the field like a hot knife through butter! 3 races, 3 wins, 6 podiums and a front row lock out… what more can a team owner ask for in one race weekend?! Both drivers have a real talent and I really hope they can continue in the Century family in 2019.